This machine is controlled by the man-machine interface with English language. Power system is controlled with hydraulic station, overflow valve is of Japanese, and selector valve is Taiwan, South Korea sensor. 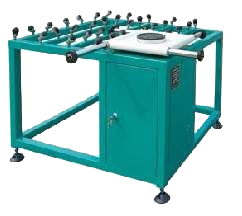 This machine is equipped with hydraulic accumulator system; its pressure for coating is more stable and longer the lifetime of machine. 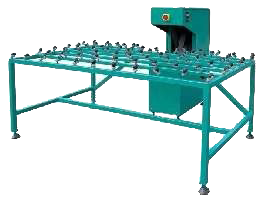 Coating speed of this machine is 8–38 m/ minute, its speed can adjust to change, it is very convenient to running and very stable. The specialized flat nozzle design makes butyl attached on the aluminium spacer more beautiful and saves about 40% butyl per M2. Special vertical structure, take PTFE sealing into use: hot air will come out upside that ensure the butyl coated not be disconnected. 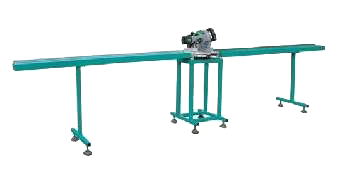 It is pneumatic driving machine. 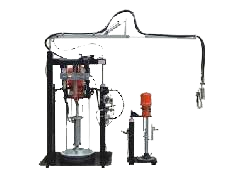 Base material supply system and curing agent supply system Using special high-pressure Piston pump, two-way equivalent feeding for the silicon, accompanied by pressurized feed Pressure plate, and fully guarantee pumping high viscosity fluid filled, to prevent mixing of air to ensure stable medium output. 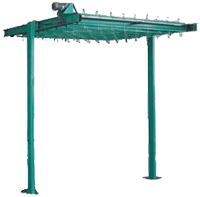 Pneumatic lifting mechanism to replace the materials quickly and easily. 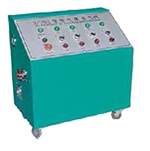 Mixer--Adoption of static reciprocating tube mixer. Small size and light weight. Imports mixed core to mix more evenly durable and reliable, the domestic unique needle and one-way valve to Ensure that mixing material does not return and to avoid pipe freezing. 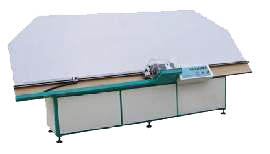 Silicon extruding system-Adoption of import glue gun, the operation is extremely simple. After the first time adjustment of gas pressure, almost no any other operation. Feeing, matching, mixing and spraying in one process. just gently pull each time (release) gun trigger, you can immediately start the whole system (off). Sensitive high-pressure protection valve (imported) to make the operation easier. The parts contact the fluid is all made of high quality stainless steel. Seal rings use imported high-quality Teflon material which is reliable and durable. Perfect service and spare parts supply so that you can use it without worry. The system is pure air, no electricity, no hydraulic, easy to adjust, simple and safe operation. The system adopts the most advanced technology and production processes, the ratio of precision (± 2%), and mix well. Optional electric heat insulation device in order to adapt to temperature changes. It can be controlled by the pedal valve with convenience control, rotates freely and stops angle. The table can be adjusted up and down. There is sensor on the ruler start the motor automatic. There is manual and automatic two job pattern. It is suitable to fill the spacer shaped by automatic aluminium spacer bending machine and the normal straight pin spacer. Filling height can be adjusted according to the size of the aluminium spacer. It can feed the desiccant automatically. It is used to fill insert gas into insulating glass to make the insulating glass better hot and cold air resistance, improve quality of insulating glass. 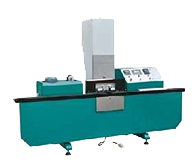 This Machine is used to bend the aluminium spacer bar into arc shape.